The sassy Phryne Fisher comes to Sydney! 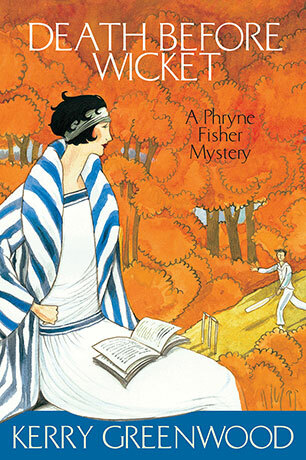 This is the tenth, classic Phryne Fisher mystery. The sassy Phryne Fisher sets the seamy side of Sydney alight in her tenth adventure. Phryne Fisher has plans for her Sydney sojourn - a few days at the Test cricket, a little sightseeing and the Artist's Ball with an up-and-coming young modernist. But these plans begin to go awry when Phryne's maid discovers her thoroughly respectable sister has left her family for the murky nightlife of the Cross. And Phryne is definitely not the woman to say 'no' when two delightful young men come to her on bended knees, begging for her help in finding their friend innocent of theft. Phryne's plans for a simple day or two of pleasure are postponed for good. It all sounds simple enough as Phryne sets investigations into motion, but when greed and fear are the motivating factors, people become ruthless and Phryne finds herself enmeshed in blackmail, secrets, lies and the dangerous influences of deep magic. Kerry Greenwood has written twelve other novels in the Phryne Fisher series, the most recent being Murder in Montparnasse (2002). She is also the author of The Childstone Cycle, Cassandra and (with Jenny Pausacker) Recipes for Crime. The Things She Loves, a collection of essays about women who kill, edited by Kerry, was published by Allen + Unwin in 1996.